I just finished reading The Letters and Lessons of Teddy Roosevelt for His Sons which was published by Vision Forum and I'm feeling very inspired. There are at least half a dozen quotes from Roosevelt that I want to type up and share in this review, but I'm not sure that that would quite serve the purpose. I confess that I really don't know very much about Theodore Roosevelt other than the fact that he was president of the United States around the turn of the last century. I've had my eye on the book Mornings on Horseback for, oh, years, but haven't quite gotten around to reading that yet. I'm more encouraged to do so now. 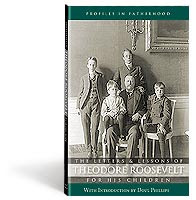 I would say that the main purpose of Letters and Lessons is to prove the point that T. Roosevelt was a family man. He was a manly family man, devoted to his wife and children, who pursued the best and called on his son's noblest instincts to rise up and be manly men themselves. Although it sounds sort of cheeky to use the phrase "manly men" (and I say it with something of a grin) it isn't really something I'm laughing about as much as I'm inspired to in the raising up of my own son and in continuing to learn how to honor my husband. The first section of this book contains letters that Roosevelt wrote individually to his four sons. The second half of the book contains more history on who Roosevelt himself was, how he was raised and includes essays and speeches in which he calls for courage and bravery from men around the country. Roosevelt never did seem to have much patience for weak and cowardly men. There was nothing namby-pamby about his own existence. Although he was fond of boxing, hunting and general sporting, he makes it clear to his sons that although he desires them to be physical fit, he also expects them to place more emphasis on character than either brawn or brain. Character mattered to Roosevelt and he cared deeply that it mattered to his sons as well. Secondly, Roosevelt was quick to point out that he was not a strong or fit child when he was growing up, nor did he come naturally to physical activities. He stated that any sport or activity he picked up, he had to work hard at to even have half a chance at succeeding. He was generally unsympathetic to the son or man who would make an excuse as to why he was unable to succeed at a given task. Wisdom and prudence, coupled with courage and bravery (and an honest hard day's work!) should produce adequate results of which one could be proud. "Of course, what we have a right to expect of the American boy is that he shall turn out to be a good American man. Now, the chances are strong that he won't be much of a man unless he is a good deal of a boy. He must not be a coward or weakling, a bully, a shirk, or a prig. He must work hard and play hard. He must be clean-minded and clean-lived,and be able to hold his own under all circumstances and against all comers. It is only on these conditions that he will grow into the kind of American man of whom American can be really proud. A boy needs both physical and moral courage. Neither can take the place of the other. When boys become men they will find out that there are some soldiers very brave in the field who have proved timid and worthless as politicians, and some politicians who show an entire readiness to take chances and assume responsibilities in civil affairs, but who lack the fighting edge when opposed to physical danger. In each case, with soldiers and politicians alike, there is but half a virtue. The possession of the courage of the soldier does not excuse the lack of courage in the statesman and, even less, does the possession of courage of the statesman excuse shrinking on the field of battle. Now, this is all just as true of boys." In a day and age where men are encouraged to take a softer, more feminine (aka "peaceful") approach to living in general, and women are encouraged to charge outside their home and stand on equal footing and ground as their male counterparts - this book is needed. It is needed to light a fire under men and inspire and remind them both who they are and what they were created to be. And what is that, exactly? Courageous and brave, unafraid to meet the worst of obstacles with frank discernment, a clean conscious and steady hand. Men were meant to do big things. God didn't create them to do small things. Neither, for that matter, did God create women for simplicity. But that's another speech for another day and I'm sure I've gotten myself into some hot water already. This book is about men and for men. (So why am I reading it?) Because I also think it does the women some good to read it and be inspired to think of men in a more honoring way. Each of the sexes have their own unique roles to play and while women are scrambling about trying to gain equal footing, in a lot of ways they are tearing their men down. We women need a vision adjustment and to that end, it might behoove us to read some more of Roosevelt's writings describing honorable manhood. This book is a good place to start. I have heard the peace quote before. I have not read this book. Carrie, I NEED it! BTW My hubby laughs at me when I read your blog because my lols are interspersed with under-my-breath mutterings of book titles and furious typing as I wish list them in my Amazon or save them in my book list on the computer! This sounds wonderful, Carrie. I just read a reference to another T. Roosevelt book (a biography, I think) that I wish now that I had bookmarked. Is Mornings on Horseback a biography? I think TR is a fascinating character about whom I would love to read more. I also always think of the movie Arsenic and Old Lace when I think of TR. Have you seen it? Hilarious! Yes, Mornings on Horseback is a biography and it received rave reviews when it first came out. I'd love to get my hands on it! Oooo, I've heard amazing things about Mornings on Horseback. Putting this one on my Amazon wish list STAT!! Thanks for such a detailed review! Since you like Theodore Roosevelt's style of manliness you might want to check out the blog: http://artofmanliness.com/. Really that is the name of it! They are big fans of T.R. Also Theodore Roosevelt The American Presidents Series by Louis Auchincloss is only 155 pages. Edmund Morris' first vol. will be a movie in 2013. The Rise of Theodore Roosevelt.